Oh that was me. Sorry I meant to post his name but somehow it didn't get under the picture. In case some of the younger posters wouldn't know who he was, he's an actor of the 40's and 50's. Maybe it's a generation thing but although I sometimes come across a young man in his 20's or 30's I might find good looking, this is more my type. But sometimes I do like a pretty face. 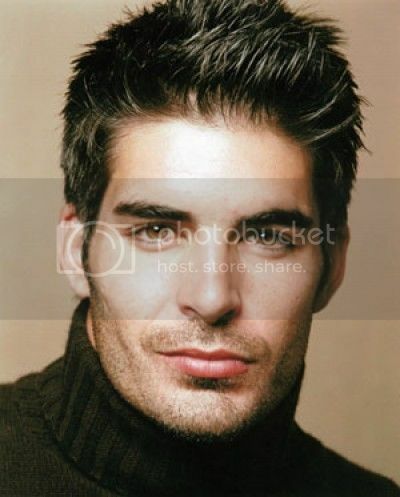 This is Galen Gering who is on the soap opera "Days of Our Lives." He looks full of himself and the hair is kind of too much, but yeah he's obscenely amazingly ridiculously unbelievably hot. If he has a great personality, the world is his oyster. Top 10 best looking guys I've ever seen (celebrities not real people). Well everyone has problems regardless of how attractive or rich or famous they are. Imagine being Britney Spears. She can't go anywhere and be left alone. She is constantly trailed by paparazzi and crazy people. What if she was looking and feeling like crap and just wanted to hide? as for men? as long as they don't stink/not wearing dirty clothing or appearing dirty and are hygenic, i think any man can get by. mostly if not always men are judged on their accomplishments, wealth, status over their looks. it's the opposite for women. looks always come first. Attractiveness is all subjective. The kind of guys who turn my head might make other people go "really?" What's the point of me posting pictures? You, as a straight dude, think this guy is hot. Good for you. We'll alert the media. Same here. The guy in OP is attractive. But I am not too enamored with him. The celebs I have liked, some would probably think "Yeah right!" or "He's ugly." Not to me though. Far as guys I have had huge crushes on. He's gotten older now. But I still think he looks good, despite the fact he's the same age as my father. lol And he can pull off bald, clean-shaved, and beared perfectly. Looks hot anyway I see him. Greg Kinnear I also find handsome. Andrew Wilson-older brother of Owen Wilson I find very attractive. Like Sean, he looks good hairy or hairless. David Boreanaz is also a handsome fellow. Least he was. Idk what he may look like now, as I only remember him from older things. Minervah's guy from DOOL is a nice one too. All better than the guy in the OP imo. Difference of taste is all. Many women find Derek Jeter & Leonardo Dicaprio hot. I find neither of these men attractive at all. Last edited by HappyRain; 04-13-2015 at 03:12 AM.. I think that in general his face/body is just ok. But I still find him very attractive, because of his charisma and personality. That's the difference between men and women. A woman can be incredibly attracted to a man because of his personality and not his looks. It rarely works the other way around, because men are visual creatures. So the model we have all been talking about, yeah he's a 10. But similarly he guy I'm dating can be a 10 to me, because of who he is as a person.